Offers > Polycom > Hosted VoIP. What Does That Mean To My Business? 10 Business People Make Their Voices Heard. Hosted VoIP is one of the fastest growing business technologies. Leading the way are solutions from Polycom HD Voice IP phones and video conferencing systems, powered by Broadsoft's BroadWorks platform. 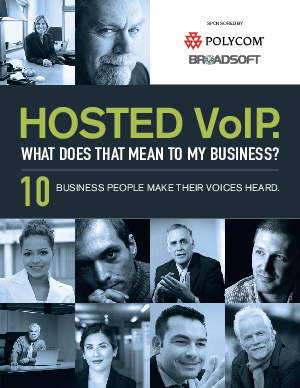 This informative guide, featuring questions from business people, provides answers and insights on how Hosted VoIP can impact communications by providing critical features and flexibility, all for significantly lower costs.